Daneshgah e Elm o Sanaat St.
Tehran, Iran and Irvine, California – November 16, 2010 – Saadat, international manufacturers of portable patient monitors, and Masimo (NASDAQ: MASI) jointly announce today CE Mark certification and the European launch of the Saadat Aria®—the first portable patient monitor with Masimo rainbow SET® Pulse CO-Oximetry™ technology for noninvasive physiological measurements. The integration of Masimo rainbow SET enables clinicians using the Aria monitor to immediately, noninvasively, and continuously measure multiple physiological parameters without invasive procedures—offering the ability to detect and treat anemia1, internal bleeding2, fluid responsiveness3, and other potentially life-threatening conditions on-the-spot, in real-time. Aria is a cost-effective and lightweight (4.3" display weighing < 2lbs) detachable patient monitor that integrates some of the most advanced noninvasive patient monitoring capabilities available today—including Masimo rainbow SET, CAS NIBP, Phasein multi-gas analyzer, and the Saadat Multi-Module (SMM) for ECG, respiration, IBP, temperature, and cardiac output—for use as both a bedside and transport vital signs monitor throughout the entire care path. As the first-and-only technology platform to noninvasively and continuously measure total hemoglobin (SpHb®), oxygen content (SpOCTM), carboxyhemoglobin (SpCO®), methemoglobin (SpMet®) and Pleth Variability Index (PVI®), in addition to Measure-Through Motion and Low Perfusion performance of Masimo SET® oxyhemoglobin (SpO2), perfusion index (PI), and pulse rate (PR), Masimo rainbow® SET provides detailed physiological data that helps clinicians to more rapidly assess patients and detect adverse conditions much earlier. According to Reza Yaghoubzadeh, CEO of Saadat, “The novelty of Aria is its capacity to monitor vital patient parameters in all care areas and during transport. 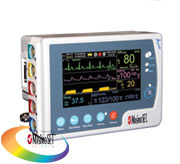 This of course would not have been possible without the integration of Masimo’s advanced rainbow SET technology platform, which provides a continuous stream of rich, reliable physiological measurements and hemodynamic data that significantly increases the amount of clinical intelligence available to medical staff—enabling more rapid and comprehensive patient assessments. We have enjoyed a strong relationship with Masimo over the years and look forward to extending our cooperation to improve patient care worldwide." The compact Aria monitor easily slides into various docking stations and, offering network connectivity, VGA output, a recorder, and an extra battery, it plays the role of a full-size multi-parameter module—making it ideal for acute and general care floors, clinics, and home health care settings. Also offered as an OEM solution, Aria can be used in defibrillators, ventilators, and anesthesia machines—providing complete vital signs and core patient monitoring parameters in a variety of clinical settings. 1Juhl A., Naqvi S., Aregbeyen O., Shander A. "Noninvasive and Continuous Hemoglobin Monitoring in an Intensive Care Unit Patient with low Hemoglobin." Society for the Advancement of Blood Management (SABM) Annual Meeting. September 24, 2010. 2 Prith P, Torp K, et al. Real Time Hemoglobin Monitoring During Liver Transplantation. A Case Report. Society for the Advancement of Blood Management (SABM) Annual Meeting. September 24, 2010. 3Zimmerman M., Feibicke T., Keyl C., Prasser C., Moritz S., Graf B., Wiesenack C. "Accuracy of Stroke Volume Variation Compared with Pleth Variability Index to Predict Fluid Responsiveness in Mechanically-ventilated Patients Undergoing Major Surgery." European Journal of Anaesthesiology June 2010;27(6):555-61. Available online here. 4Forget P.; Lois F.; De Kock M. "Goal-Directed Fluid Management Based on the Pulse Oximeter-Derived Pleth Variability Index Reduces Lactate Levels and Improves Fluid Management." Anesthesia & Analgesia. August 2010. Available online here. 5Bernard AC et al. Intraoperative transfusion of 1U to 2U of packed red blood cells is associated with increased 30-day mortality, surgical site infection, pneumonia, and sepsis in general surgery patients. Journal of the American College of Surgeons. 2009;208:931-937. Available online here. 6Surgenor SD et al, for the Northern New England Cardiovascular Disease Study Group. The Association of Perioperative Red Blood Cell Transfusions and Decreased Long-Term Survival After Cardiac Surgery. Anesthesia & Analgesia 2009; 108:1741-1746. Available online here. 7Ehrenfeld J., Henneman J. "Impact of Continuous and Noninvasive Hemoglobin Monitoring on Intraoperative Blood Transfusions." American Society of Anesthesiologists, 2010 Annual Conference, October 18, 2010. Available online here.